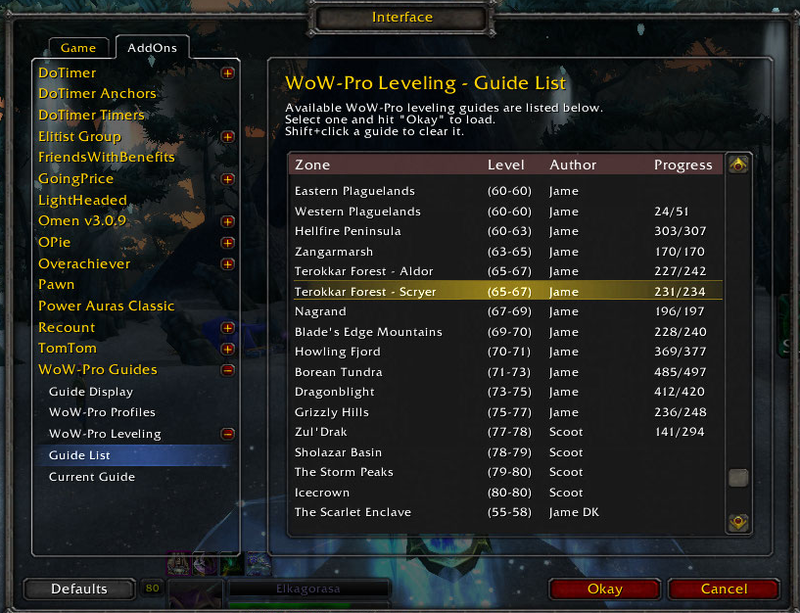 I have long been a big fan of Jame's leveling guides over at WoW-Pro.com. These online guides helped Elk level fairly quickly and painlessly from 20 to 75. The guides were concise, with maps and locations to grind for quest items. (He specifically designed the guides to avoid grinding extra mobs to level.) At any time, you could find printed, dog-eared copies of these guides, sitting around my computer, with crossed out segments, and circles of what I still needed to complete. They were extremely helpful, but cumbersome. 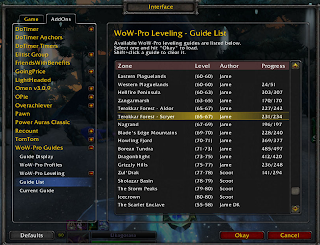 "Oh man, I skipped a line and missed that quest item, I need to run back..."
Earlier this week, the Wow-Pro team has released an add-on version of their leveling guide. I loaded up this add-on yesterday (off Curse, WoWMatrix hasn't added it yet) and was quickly impressed. Once, I updated my ACP Questing build to include LightHeaded, and TomTom, I was greeted with a simple interface for all my questing zones. Clicking on a zone, I see a count of my completed vs. total quests for each of these zones. Clicking on Terrokkar Forest, I see I have only 7 quests left. I open up this quest guide, and immediately, TomTom kicks in with distance and direction to the first quest giver. 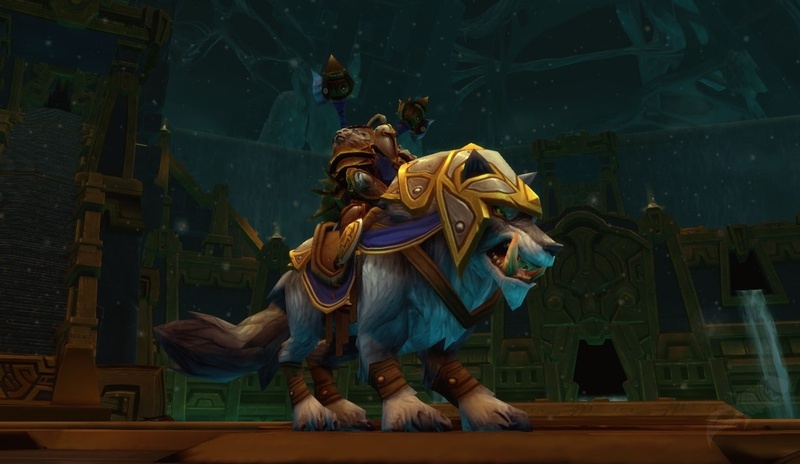 Grab flying mount, complete quest, next in chain pops up, and repeat. I kill a giant spider and then I get the Terror of Terrokkar achievement. Thinking Loremaster, anyone?? Coming up to quest NPC, with only 3 quests left in zone. It doesn't map out EVERY quest, but those best suited to leveling. I am 13 quests away from the Nagrand Slam, but can't find the breadcrumb. I can see from WowHead, it's the GreatMother quest chain. I do have the last 2 "Against the Legion" quests left, maybe it will popup after I finish those. As a volunteer driven guide, there aren't guides for every zone. The two Outlands zones that I haven't done any questing in, Netherstorm and Shadowmoon Valley, neither have guides. Maybe I should volunteer? If I load a guide in the wrong zone, it maps out the location wrong for the quest giver. 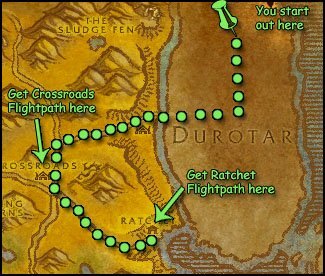 It didn't do this for everyzone; from Dalaran, it correctly said that the Barrens was several thousand yds away. Nagrand and Terrokkar it didn't. Should report bug to team. Overall, its a great addon for leveling. It's simple to use. It provides detailed maps, quest item pickup and when integrated with lightheaded, most all the info you'll need to level up and possibly finish loremaster.